Make anything you want, with free music software of your choice, and <1ms latency. Bela is back, smaller than ever - a pocket-sized £120 computer for sound. Embedded mobile tech has in recent years brought us pocket-sized, low-power boards that can match the performance of what not so many years ago we actually called a desktop computer. And that’s led to high-profile boards like the cheap Raspberry Pi. The problem has been, many of the cheapest of these machines were limited in computational power, and more importantly, had audio performance that ranged from middling to disastrously awful, both in audio quality and reliability/responsiveness. But you shouldn’t settle for that. The whole point of building an embedded audio system dedicated to the task of music making – like a DIY effects pedal or synth or sound installation – ought to be that audio performance is better than on your PC. You’ve got a pocket-sized board that isn’t running weird file indexing, OS updates, buggy Facebook code open in twenty tabs, and the like. It ought to just do the number crunching you need for the granular delay you want to sing along with, and do it really well. A few audio engineers have decided to brave the challenge. It’s not an easy thing to do: these little boards are so cheap that there’s not a whole lot of money to be made on them. It’s not just a small computer, though – there’s more. Low latency. 1ms round-trip for audio, or a minuscule 100us round-trip via analog and digital I/Os. Run your favorite free audio software. Support for the graphical patching environment Pure Data (Pd), the crazy-powerful code world of SuperCollider, plus C and C++, and community support for FAUST, Python, etc. An IDE in your browser. Fire up your browser and use a built-in IDE with oscilloscope and spectral analysis and documentation and more. Sensors! High-resolution sensor inputs onboard open up interesting interfacing with the real world, whether you’ve got a wearable technology idea, an interactive installation, or a unique custom interface. The applications should be clear here. You could ditch your laptop and run a granular looper on a pocket-sized box. You could hook up some sensors and invent your own weird instrument. You could make a custom vocoder and bring this with a mic and croon along at “robot lounge night.” You could produce a runway show of electronically singing couture. You could devise a series of installations and turn into the next Nam June Paik and someday have a solo show at the Guggen– well, possibly at least some hipster gallery somewhere. You get the idea. Bela winds up pricing out pretty nicely, too. The smart buy is a £120 all-in-one kit (£110 intro price through March 9). That gets you cables, the Bela, the PocketBeagle base board, and a pr-flashed SD-card. 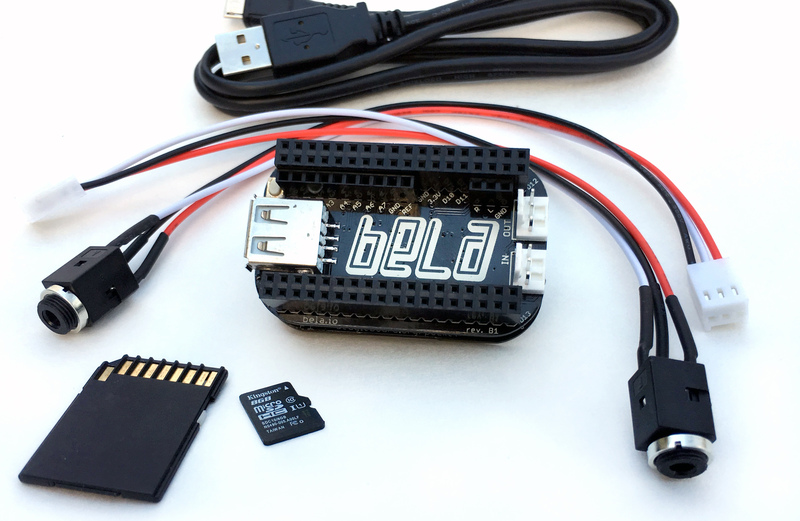 If you prefer to source your own parts, you can get just the Bela Mini for £60 (£55 intro). Here’s what’s in the kit. 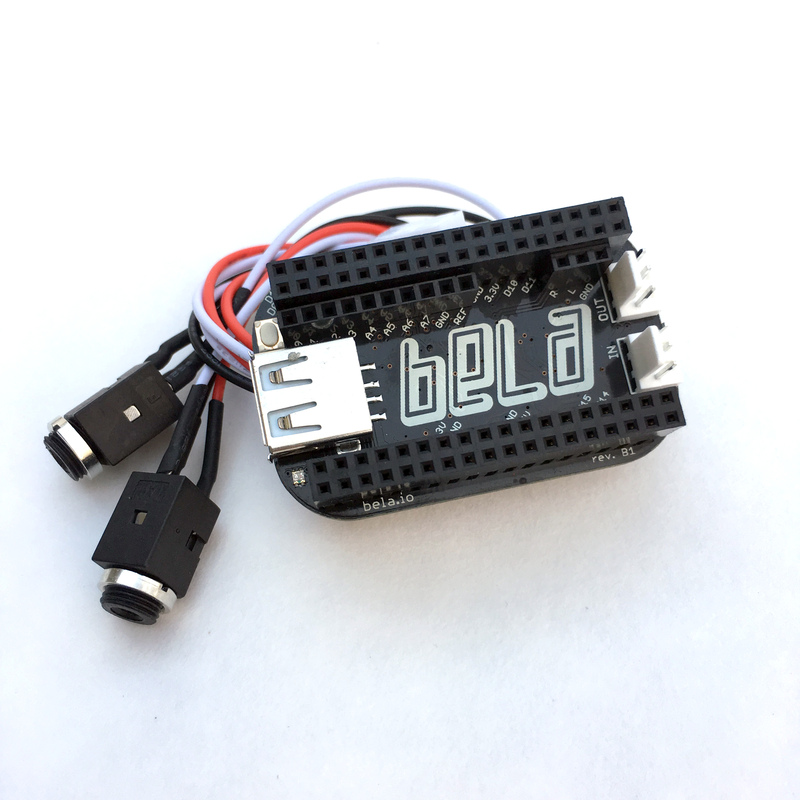 It’s bigger, but the original Bela has basically the same specs and ships now if what I’ve done is make you impatient to own one now, rather than wait for May. Basically, what’s new on the Bela Mini is really the tiny size. That opens up projects where small size matters. (The Pisound above is really just about music projects, more than wearable tech and the like, by contrast – but of course by virtue of being larger affords more space for full-sized ports!) The original Bela will remain available, with “capelets” for adding additional features. And all for the price of one basic Eurorack module. Who said electronic music was just for the rich kids?